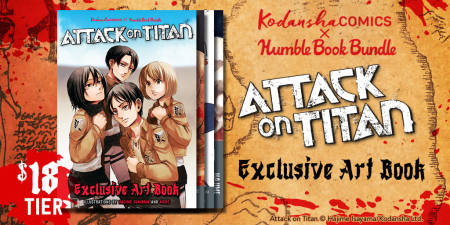 With sensational art style and riveting story set in a world of man-eating Titans threatening humankind, Hajime Isayama’s dark fantasy Attack on Titan has touched a nerve in our own time of historical uncertainty—and its popularity has only grown with the hit anime now on the cusp of Season 3 … but the story doesn’t stop there! 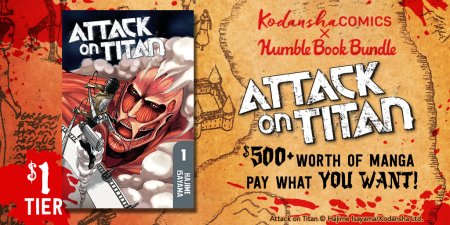 Starting Wednesday January 17 Kodansha Comics and Humble Bundle team up once again to present you our most ambitious manga bundle yet: the Humble Manga Bundle: Attack on Titan Universe. 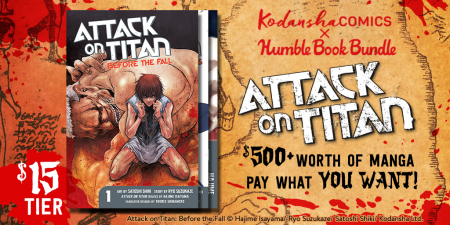 That's $500+ worth of digital manga—or 44 complete volumes—including the first 22 volumes of Hajime Isayama’s masterwork, plus all volumes of the Lost Girls, No Regrets, Before the Fall, Junior High, and Spoof on Titan spinoff series! That's a serious download of content that takes you well beyond the second season of the anime series and dives deep into all the side stories of your favorite characters. How does it work? Name your price. 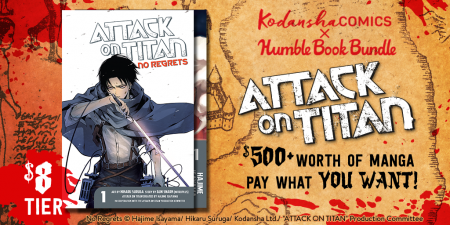 Together, the books in this bundle usually cost as much as $517. At Humble Bundle, though, you choose the price! Read ’em anywhere. These comics are available in multiple formats including CBZ, PDF, and ePub, so they work on your computer, e-readers, iPads, cell phones, and a wide array of mobile devices! Instructions and a list of recommended reading programs can be found here. Support charity. 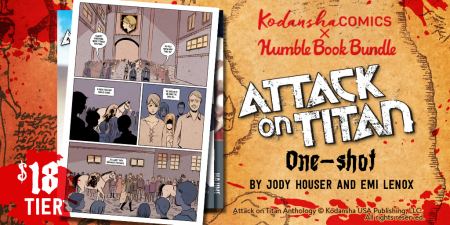 Choose where the money goes—among Kodansha Comics and two preselected charities or if you'd like, a charity of your choice via the PayPal Giving Fund. For details on how this works, click here. If you like this bundle or like what Humble Bundle does, you can leave a Humble Tip too. This special bundle ends WEDNESDAY, January 31, 10:59 A.M. PACIFIC TIME. Born in 1986 in Oita Prefecture. In 2009, Hajime Isayama started his first series, Attack on Titan, in Kodansha’s Bessatsu Shonen Magazine. It went on to become a global phenomenon as both a bestselling manga and popular anime series. Support the artist! Watch this video of Hajime Isayama drawing characters from Attack on Titan on Kodansha Comics’ YouTube Channel!